Bacterial ribosome, with the small subunit in green and the large subunit in blue. Ribosomes are one of the wonders of the cellular world, and one of the many wonders you can explore yourself at the RCSB PDB. In 2000, structural biologists Venkatraman Ramakrishnan, Thomas A. Steitz and Ada E. Yonath made the first structures of ribosomal subunits available in the PDB, and in 2009, they each received a Nobel Prize for this work. Structures are also available for many of the other players in protein synthesis, including transfer RNA and elongation factors. Building on these structures, there are now hundreds of structures of entire ribosomes in the PDB, revealing the atomic details of many important steps in protein synthesis. After solving the structures of the individual small and large subunits, the next step in ribosome structure research was to determine the structure of the whole ribosome. This work is the culmination of decades of research, which started with blurry pictures of the ribosome from electron microscopy, continued with more detailed cryoelectron micrographic reconstructions, and now includes many atomic structures. By using small pieces of mRNA, various forms of shortened or chemically-modified tRNA, purified protein factors, and modified ribosomes, researchers have solved the structures of ribosomes in the act of building proteins (PDB entry 4v5d). Looking at all the different forms of life on the Earth, we find that all living organisms have ribosomes and that they come in two basic sizes. Bacteria and archaebacteria have smaller ribosomes, termed 70S ribosomes, which are composed of a small 30S subunit and large 50S subunit. The "S" stands for svedbergs, a unit used to measure how fast molecules move in a centrifuge. Note that the values for the individual subunits don't add up to the value for the whole ribosome, since the rate of sedimentation is related in a complex way to the mass and shape of the molecule. The ribosomes in our cells, and in other animals, plants and fungi, are larger, termed 80S ribosomes, composed of a 40S small subunit and a 60S large subunit. Strangely, our mitochondria have small 70S ribosomes that are made separately from the larger ones in the cytoplasm. This observation has lead to the hypothesis that mitochondria (and chloroplasts in plant cells) are actually bacteria that were caught inside cells early in the evolution of eukaryotic cells. Now, they live and reproduce happily inside cells, focusing on energy production and relying on the surrounding cell for most of their other needs. 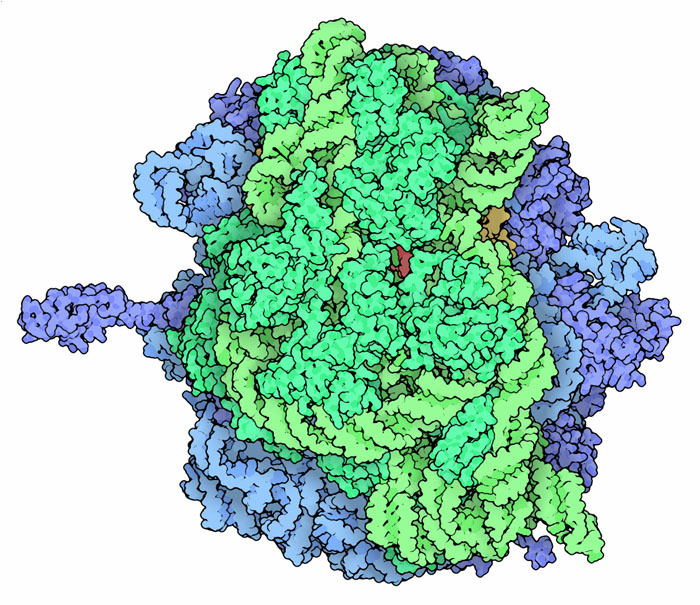 The early structures revealed many of the basics of ribosome action. They showed that ribosomes are ribozymes, using RNA and not protein for their reaction, and thus supporting the idea that RNA was central to the early evolution of life. They revealed the importance of the ribosomal proteins for stabilizing and locking the structure of RNA in the ribosome. With the new structures, however, we can start delving into the atomic details of genetic information readout and peptide synthesis. Protein synthesis occurs in three major steps: initiation, elongation, and termination, and structures are available that show aspects of each one. Initiation complex, with transfer RNA in yellow and messenger RNA in red. The ribosome gets started in a process called initiation. Several initiation factor proteins deliver the mRNA to the small subunit, line up the first tRNA, and guide the association with the large subunit. 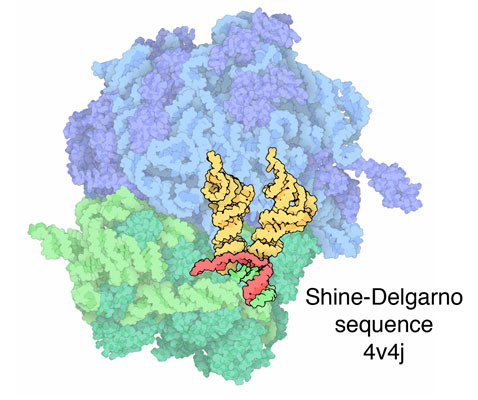 This structure (4v4j ), shows a special sequence in the mRNA, called the Shine-Delgarno sequence after its discoverers, which is associated with the last part of the RNA chain in the small subunit. This lines up the mRNA in the right place, making it ready for a special initiator tRNA. 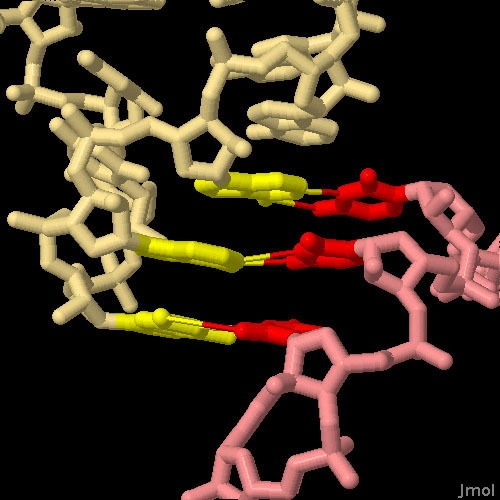 In the picture, the little piece of mRNA is shown in red and tRNA is shown in yellow. A note about the picture: the mRNA, tRNA and protein factors all bind inside the ribosome, between the two subunits, so it is tricky to create a picture that shows what is happening. These pictures show the mRNA, tRNA and other molecules, along with a lightened picture of the ribosome to show their placement in the whole complex. Steps of elongation, with EF-Tu delivering tRNA (left), synthesis of the peptide bond (center), and translocation by EF-G (right). After the ribosome gets set up, it begins to read along the mRNA strand, building a protein one amino acid at a time. In the structure shown here on the left (4v5g ), a new tRNA is being delivered by the protein EF-Tu (shown in purple). In the center structure (4v5d ), three tRNA molecules are bound inside the ribosome. The left tRNA (the A site) has the amino acid that will be added, the central tRNA (the P site) holds the growing protein chain, and the right tRNA (the E site) is finished with its job and is ready to be ejected. After the protein chain is transferred from the middle tRNA to the A-site tRNA, the protein EF-G helps to push everything one step forward, as shown in the structure on the right (4v5f ). Termination complex with a release factor in magenta. At the end of the gene, the ribosome encounters a stop codon, telling it to finish up making the protein. Release factor proteins recognize the stop codon and force the ribosome to release the finished protein. This structure (4v4r ) shows one of the release factors binding to mRNA in the A-site. The structure was solved at low resolution, so only approximate coordinates for the release factor protein and the ends of the mRNA were obtained. Sites of antibiotic action on the ribosomal subunits. Since ribosomes are essential for life, they make attractive targets for antibiotic drugs. Of course, you need to be careful not to attack our own ribosomes, otherwise you would kill yourself along with the infection! Fortunately, bacterial ribosomes have many small differences from our own ribosomes, so there are many antibiotic drugs that specifically attack 70S ribosomes. Two examples are included here, and there are many other examples in the PDB. On the left, tetracycline (in red) is bound to the small subunit (1hnw ), blocking the binding of the tRNA. On the right, chloramphenicol (in red) is (1nji ), blocking the reaction that adds amino acids to the growing protein. The new structures of intact 70S ribosomes reveal the secret of life. 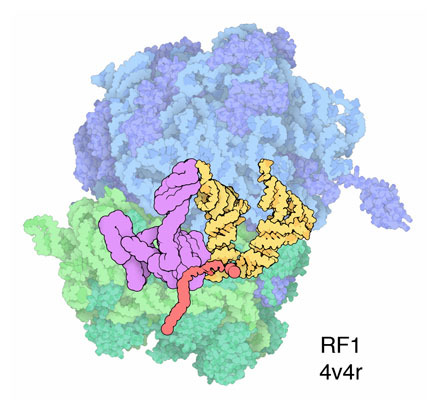 This illustration shows a closeup of the "decoding center" of the ribosome (PDB entry 2wdg ). This is the place where an incoming tRNA anticodon (shown in yellow) is matched with an mRNA codon (shown in red). As you might imagine, it is essential that this match is perfect, so that only the proper tRNA is paired, and thus that only the correct amino acid is added to the growing chain. The ribosome uses several interactions to test this pairing, ensuring that the base pairing is correct. To look closely at these interactions, click on the image for an interactive Jmol. The ribosome is composed of two subunits that assemble around the mRNA into a functional complex. What are the advantages of this? Can you find other examples of molecules that surround RNA or DNA strands? structures in the PDB, compare the different types of data that are used to support the structures, including crystallographic structures at atomic and near-atomic resolution and electron micrograph reconstructions at lower resolution. 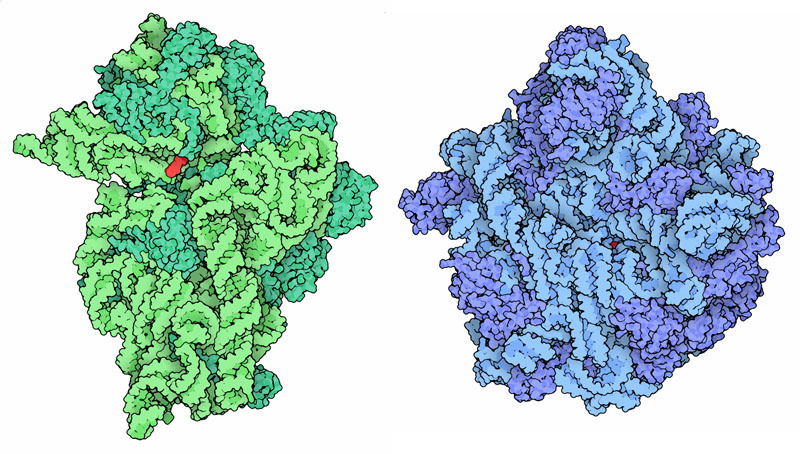 A. Korostelev and H. F. Noler (2007) The ribosome in focus: new structures bring new insights. Trends in Biochemical Sciences 32, 434-441. T. A. Steitz (2008) A structural understanding of the dynamic ribosome machine. Nature Reviews Molecular Cell Biology 9, 242-253. T. M. Schmeing and V. Ramakrishnan (2009) What recent ribosome structures have revealed about the mechanism of translation. Nature 461, 1234-1242. E. Zimmerman and A. Yonath (2009) Biological implications of the ribosome's stunning stereochemistry. ChemBioChem 10, 63-72.